You are here: Home » Uncategorized » Tornado Watch #233 – !CANCELED! 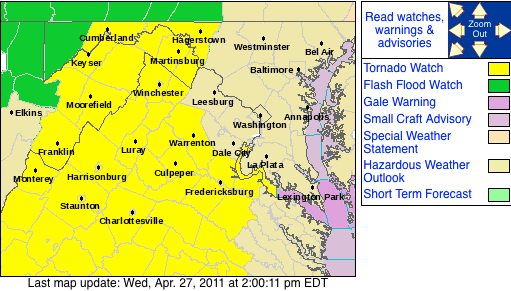 Via NWS: A Tornado Watch is in effect for virtually all of Central Virginia, including Nelson & Wintergreen until 8PM EDT tonight. Look to the right under Nelson Weather Alerts for the absolute latest updates and remember to refresh your browser often.
! CANCELED – CANCELED – CANCELED! This watch has been replaced by a new Tornado Watch #240 until 2AM Thursday. Click here for new information on this watch. ORGANIZED/SUPERCELL STORMS CAPABLE OF LARGE HAIL AND DAMAGING WINDS. Nelson & Wintergreen : Severe Thunderstorm Watch – ! CANCELED !